The scientific program was arranged by D. Jerome Fisher, A. J. Frueh, Jr., and C. E. Tilley, and the sessions were held at the United States National Museum, Smithsonian Institution. The chairmen for each of the three sessions were C. E. Tilley, Symposium on Layered Intrusions (April 18), C. S. Hurlbut, Jr., General Session (April 19), and A. J. Frueh, Jr., Symposium on the Mineralogy of the Sulfides (April 20). These three gentlemen also served as editors of the papers of their sessions. The publication of the papers and proceedings of the Third General Meeting was made possible by the financial support of the National Science Foundation. J. J. Papike (Editor) And Francis R. Boyd, Joan R. Clark, And W. G. Ernst (Associate Editors), William T. Holser (Coordinating Editor), 1969, i-viii + 332 Pages. The pyroxene and amphibole mineral groups have been the focal points of numerous experimental, theoretical, and field-oriented studies in recent years. Many exciting new results have been obtained since the 1966 International Mineralogical Association Symposium on Pyroxenes and Amphiboles held at the University of Cambridge, England. During September 7-11, 1969, another pyroxene-amphibole symposium will be held at the Virginia Polytechnic Institute, Blacksburg, Virginia. 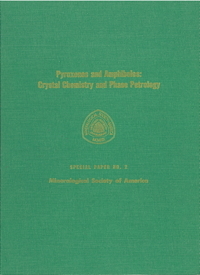 Pyroxenes and Amphiboles: Crystal Chemistry and Phase Petrology was published to coincide with this symposium. 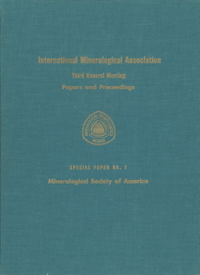 Formal papers given at the symposium included new research results not currently at the manuscript stage, and abstracts for these papers published in the January-February, 1970, issue of The American Mineralogist. BENJAMIN A. MORGAN (Editor), B. F. JONES, GUNNER KULLERUD, AND E. F. OSBORN (Associate Editors), and WILLIAM T. HOLSER (Coordinating Editor), 1970, i-viii + 319 pages. 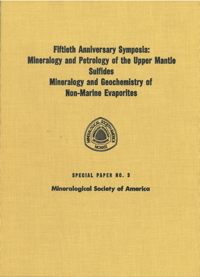 The Mineralogical Society of America on November 8 and 9, 1969, celebrated the fiftieth anniversary of its founding in Atlantic City, New Jersey. The celebration included the presentation of three special symposia, with Harry H. Hess of Princeton University as chairman of the symposia committee. He personally organized the sessions for a symposium on the Mineralogy and Petrology of the Upper Mantle. A symposium on Sulfides was organized by Gunnar Kullerud of the Geophysical Laboratory, and a symposium on the Mineralogy and Geochemistry of Non-Marine Evaporites was organized by Blair F. Jones of the U. S. Geological Survey.